Rand Al-Bustanji (3rd right) sits on the sidelines with her teammates during practice. 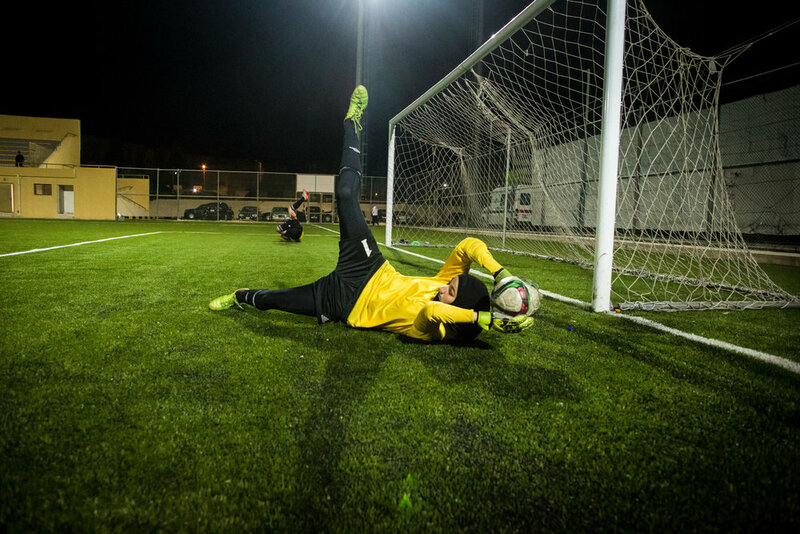 Rand is the goalkeeper for Jordan’s women’s under-17 team and competed in the FIFA world cup held in Jordan in 2016. Rand Al-Bustanji, 17, poses for a portrait outside her family’s home in Amman, Jordan. Rand Al-Bustanji walks into her school to pick up her younger sister and meet up with her friends. Rand Al-Bustanji (center) visits with her friends in their science classroom. Rand hopes to continue with sports, but also has aspirations of studying computer science in university. Rand packs up her football uniform into her sports bag. 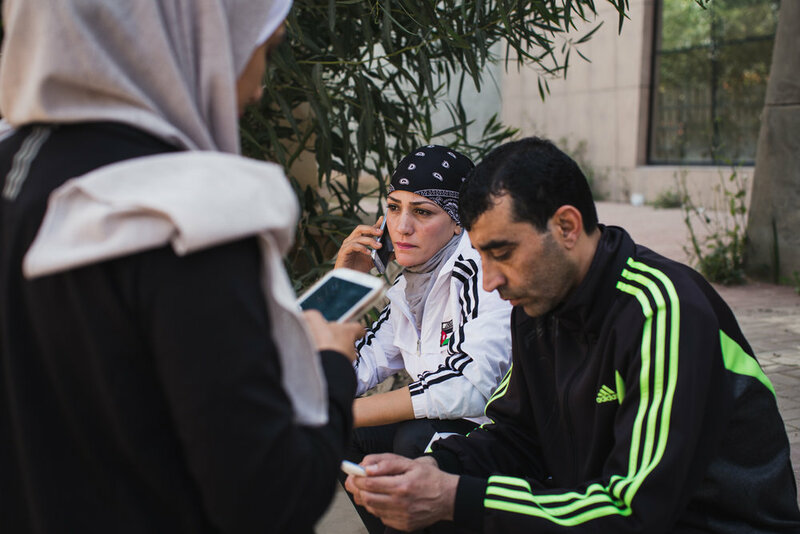 Rand’s family lives about 20 minutes south of Amman, and her training - which she attends several times a week - is at the Sports City complex in central Amman; her father drives her about an hour each way and watches her practice sessions. Rand picks up her younger sister (left) from their school south of Amman. Between her studies, football practice, religious devotion, and duties helping her younger siblings, Rand has a full schedule. Rand al-Bustanji (2nd left) and her teammates listen to their coach at a practice session at Sports City in Amman, Jordan. Rand (right) and her teammate run laps during a training session. Rand (right) and her teammate practice blocking goals. Rand Al-Bustanji dives to save a goal. 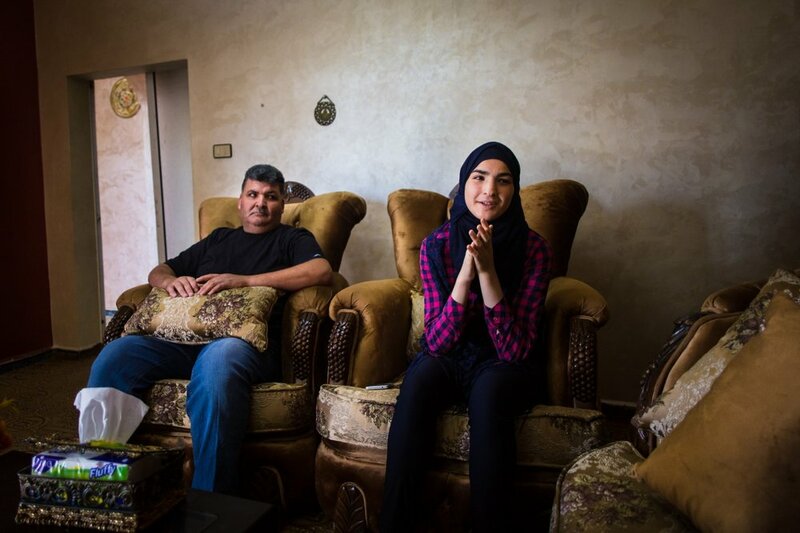 Rand Al-Bustanji sits at home with her father. Although he was initially worried about his daughter joining a sports team, he’s now very supportive of Rand’s ambitions, and says he feels proud when he sees her play. 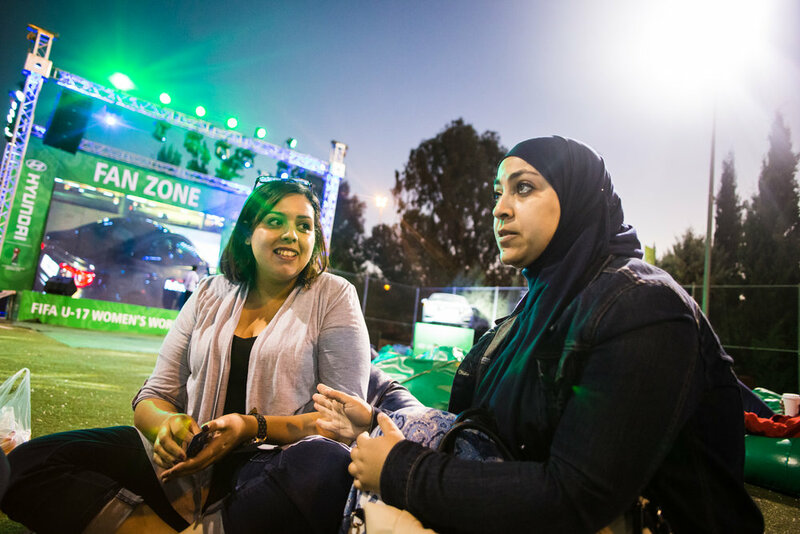 The fans: Esra'a Abed Alqader (left) and Fadwa Abushaikha, two volunteers for the U17 women's world cup in Jordan, sit together and watch a match between Spain and Japan at the Fan Zone in King Abdullah Park in Amman, Jordan, on Oct. 17, 2016. 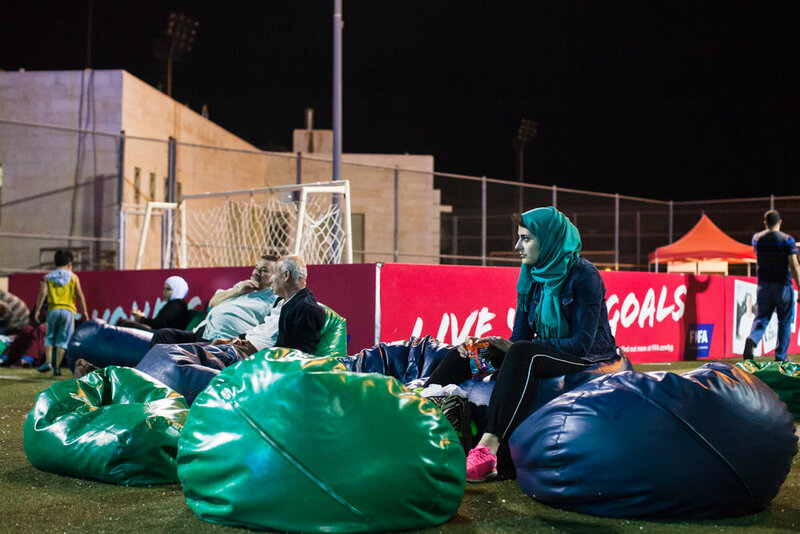 Football fans sit and watch televised matches at King Abdullah Park during the FIFA U-17 women’s world cup, hosted in Jordan in 2016. Sana Kayyali and Reem Habib stretch and do yoga poses in between kicking and punching exercises during a self defense class at She Fighter in Amman, Jordan, on August 21, 2015. The She Fighter studio was founded by Lina Khalifeh, and offers self defense classes to young women to protect against harassment. Two students help each other wrap their hands before starting their self defense class at She Fighter in Amman, Jordan on August 21, 2015. The She Fighter studio was founded by Lina Khalifeh, and offers self defense classes to young women to protect against harassment. Reem Habib and Sana Kayyali practice different punching and kicking techniques in a self defense course at She Fighter in Amman, Jordan, on August 21, 2015. The She Fighter studio was founded by Lina Khalifeh, and offers self defense classes to young women to protect against harassment. Reem Habib, Sana Kayyali, and Selina Hajarat practice their moves in front of a mirror during class at She Fighter in Amman, Jordan, on August 21, 2015. The She Fighter studio was founded by Lina Khalifeh, and offers self defense classes to young women to protect against harrassment. Nour Abu Rahma and Selina Hajarat practice different striking techniques during a self defense class at She Fighter in Amman, Jordan, on August 21, 2015. The She Fighter studio was founded by Lina Khalifeh, and offers self defense classes to young women to protect against harassment. Nour Abu Rahma and Selina Hajarat practice kicking together during a self defense class at She Fighter in Amman, Jordan, on August 21, 2015. The She Fighter studio was founded by Lina Khalifeh, and offers self defense classes to young women to protect against harrassment. Reem Habib collapses on the floor, laughing, after holding the plank position during a self defense class in Amman, Jordan, on August 21, 2015. The She Fighter studio was founded by Lina Khalifeh, and offers self defense classes to young women to protect against harassment. Zaina and Juwana Ghosheh practice high kicks during a self defense course at She Fighter in Amman, Jordan, on August 21, 2015. The She Fighter studio was founded by Lina Khalifeh, and offers self defense classes to young women to protect against harassment. Lina Khalifeh, founder of She Fighter, trains young women in self defense techniques to protect against sexual harrassment. 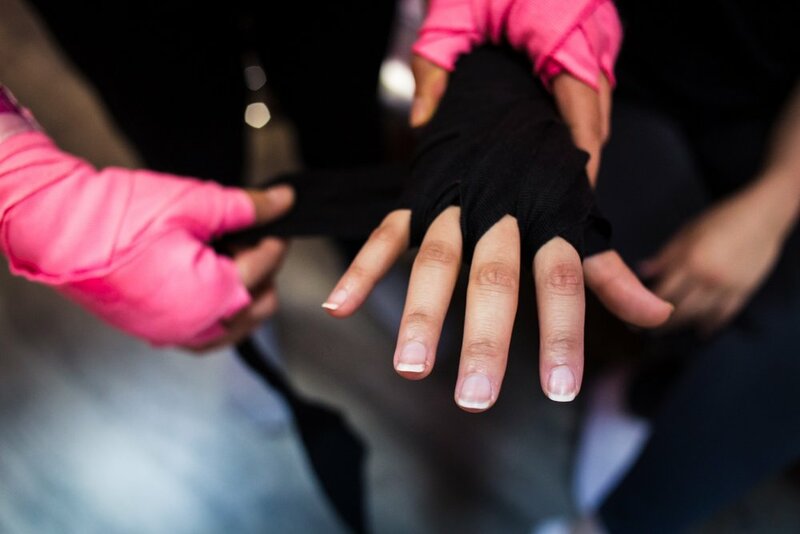 Lina opened her studio three years ago in Amman, Jordan, for women to have a safe, fun, women-only environment to learn self defense and stay physically fit. 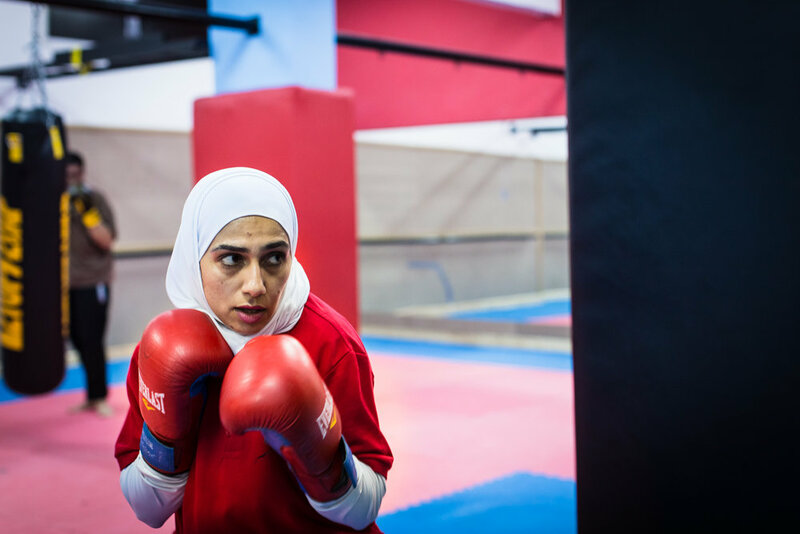 Young women athletes in Jordan take up sports for a number of reasons: challenging perceptions about femininity, self defense, or a pure love of the game and competition. 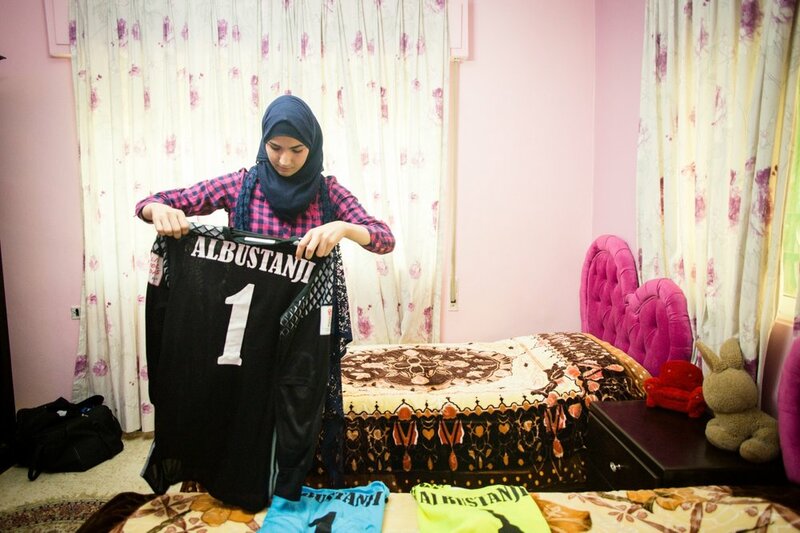 I spent a week following Rand al-Bustanji, the goalie for Jordan's young women's football team, who competed in the FIFA U-17 Women's World Cup - which was hosted by Jordan for the first time in 2016. Though Rand's father was initially worried about his daughter participating in sports, he's now her biggest cheerleader, taking her to practices and watching all her games. But knowing options are limited for professional athletes in Jordan, Rand is studying hard to get into a good university. 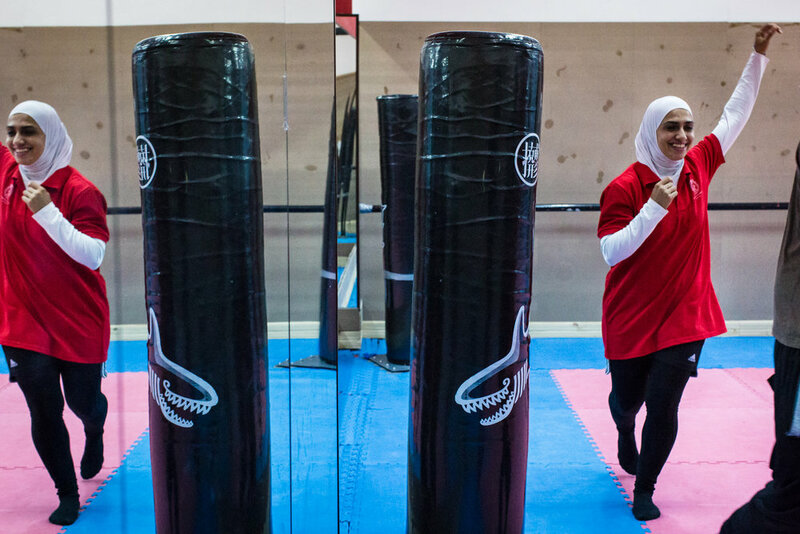 For Businesspunk Magazine, I spent a day at boxer Lina Khalifa's gym, She Fighter, where girls of all ages come to get a good workout and learn self defense tactics against would-be harassers. Khalifa herself was inspired to start teaching self defense after a friend confided in her that she had been abused by her father and brother. And Asma al-Ramini is another top female athlete in Jordan; last year she traveled to Kazakhstan to compete in the Women's World Boxing Championships.